As a brand, Heartland began its life as somewhat of an assistant to other RV manufacturers at the time. By building for other manufacturers, the founders of Heartland learned a wide variety of tips, tricks and techniques to building the best RV at relatively reasonable prices. Not only did they see and experience best practices in how RVs were built, the founders of Heartland RVs got to take note of what did not work or could be improved upon for a time when they began to build their own product line. A relatively new company, Heartland started making their own line of RVs in 2003 and unlike other manufacturers that started with the smaller Travel Trailers, Heartland set out to create a ’Top of the Line’ Fifth Wheel RV, which it branded “Landmark”. With its exclusive features package at the time, the Heartland Landmark setup a strong foundation for Heartland RVs to build upon. In addition to paying high attention to detail in their builds, Heartland has been and continues to be a leader in RV innovative technology. Since the introduction of the “Universal Docking Center” and “Tight Turn Technology”, Heartland has led the RV industry by setting new standards for RV construction that give the customer increased ease of use and convenience, after all, they are making RECREATIONAL vehicles. Like other high-quality RV manufacturers, Heartland offers access to an owners’ club. This free membership not only helps with connecting Heartland RV owners, but sets up “meet-ups” across the nation at discounted rates for members. The chapter and region “rallies” involve many owner created activity plans that help even the most introverted of people feel welcome. At Delmarva RV Center we take pride in our work and go out our way to ensure EXCELLENT customer service. We carry both new and used Heartland RVs with a variety of floorplans and models on hand or available for order. Our service technicians are expertly trained and operate our multiple manufacturer authorized service facility. When you think of Heartland RV, you can think of quality engineering and a company that is always focused on the next generation of engineering for all types of recreational vehicles. Heartland is continuously satisfying customer demands and leads the way in engineering and safety. 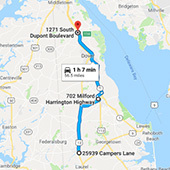 Whether you’re looking for a Heartland Luxury RV, Heartland Full Profile RV, Heartland Mid Profile RV, Heartland Toy Hauler, Heartland Lightweight RV, Heartland Travel Trailer, or a Heartland Destination Trailer Delmarva RV Center will find you the perfect Heartland model to fit your needs.